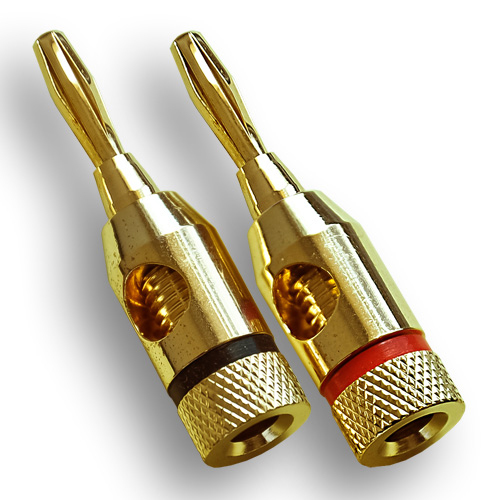 This pair of premium banana plug speaker connectors will easily connect your amplifier or receiver directly into your speakers. That means you won't have to strip and twist speaker wire to make the connection. What makes ours better than the others is that OSD banana plugs are made of pure copper with 24K gold plating with a titanium series 4mm banana jack for superior results. The gold plating offers a more reliable electrical collection. Plus, you'll pay the lowest price for ours with our price-match guarantee. 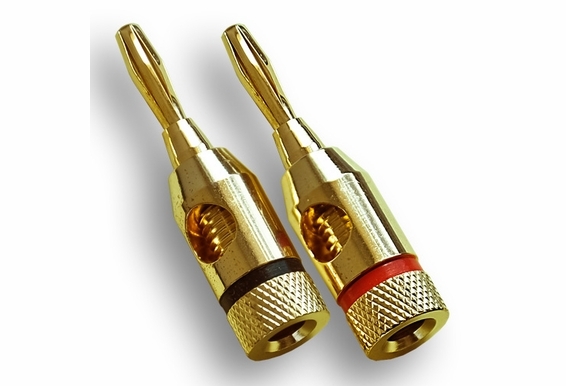 The banana plug connector has a banana-shaped prong that attaches easily to the end of the speaker wire. This pair of speaker connectors works with 8-gauge to 16-gauge wire. All our products are environmentally friendly RoHS-compliant audio/video solutions. Every product includes lifetime technical support for your small to whole-house audio and home theater DIY entertainment projects. Also shop our speaker wire and audio/video wall plate bargains. A banana plug is mainly used to insert speaker wire coming from an amplifier or receiver directly into the speaker. The banana plug is named after its shape. It is a slender, but bulging prong that is similar to a banana. However, unlike bananas, the banana plug is not bent, but straight. Other uses for the banana plug is to test electronic equipment - specifically used to terminate patch cords. It should be noted that the banana plug is the male version and the banana jack is referred to the female version of the plug. can I pre-order the banana plugs and or the iw 550 speakers before hand and have them delivered when they arrive ? How do you connect the wire? Are you able to piggyback with another set of banana plug to the back of this plug for a second set of speakers from the same output? Will this work with 16 gauge wire? What's the difference between Compact Banana Plug and a regular banana plug. Will it fit the same female receptical as the regular plug?